I’ve just returned from my annual pilgrimage to Kuapa Kokoo’s AGM to report to them on how Divine is doing. On the way there the Chair of Comic Relief, Peter Bennett Jones and I visited Kwabeng, which is the President’s Society. It was the first time Peter had been to a Kuapa farm to see cocoa growing and how beans are dried on a bamboo table. Comic Relief has supported Kuapa Kokoo since 1994 but this is the first time Peter had visited the farmers. 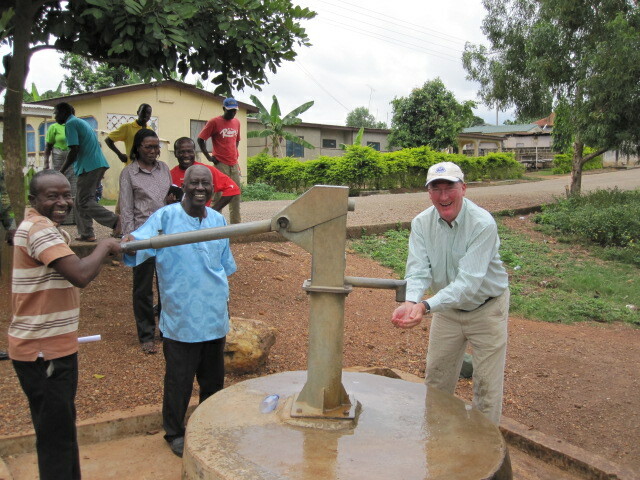 He made a nice speech about his family farming in Britain and was delighted to see the water well that Kuapa had sunk using Fairtrade premiums. I was joined later by Hannah from Twin and Rosie from Body Shop – it was their first Kuapa AGM and a great introduction to this amazing co-operative. The AGM was a celebration. 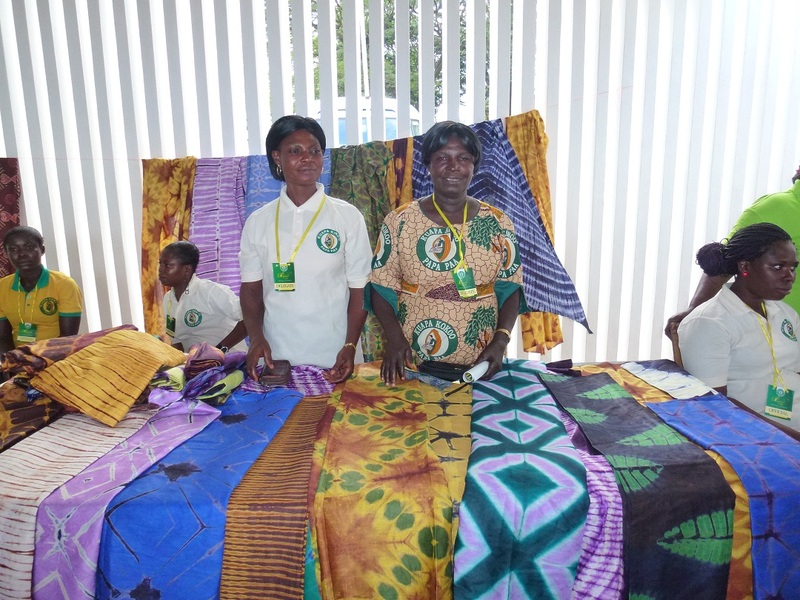 There was a great display from the Women’s project with stalls displaying the different products that Kuapa women had made or grown. Beautiful batiks including ones with Kuapa’s logo, soap from palm oil and cocoa pods, palm oil, garry and lots of fresh produce. The delegates meeting began with a presentation of the combined offices and conference centre that Kuapa is proposing to build so that all the different parts of Kuapa could be in one building. They then discussed the use of Fairtrade Premiums; the farmers were keen to receive cash bonuses and machetes but also recognised the need to invest in the business. The roving medical clinics which had visited 30 districts were held up as a success, as was the women’s project. Kuapa has invested significantly in internal controls to ensure that they are delivering on their Fairtrade promises, they also run one of the only farmer-run Child Labour Awareness Programmes which has attracted the support of ILO. The meeting also agreed to a set up a constitution review committee and elected members to sit on it. The second day was the formal business of the AGM. 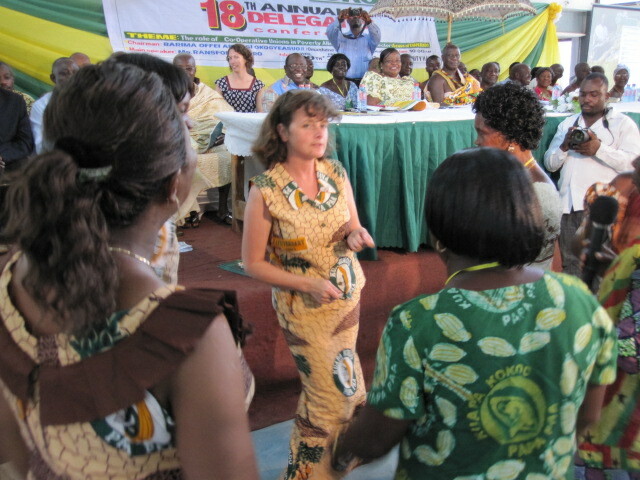 As we entered, the women, who were very well represented, were dancing and singing Kuapa songs. The meeting was chaired by Barima Ofe Akwasi Okogyeasuo II, a local Chief who arrived with his full entourage. He had a young man to hold the official parasol over his head for the whole length of the proceedings! He was adorned in brightly coloured Kente cloth and Ashanti gold. There were speeches from the President, The MD of KKL and many honoured guests including Cocobod, Kraft and visiting farmers from Cameroon. Regina kindly translated my speech into Twi as I presented my speech. I focussed on two programmes that Divine has supported through our Producer Support & Development fund. Firstly, the membership database, so that Kuapa can look after its members and run its operations more efficiently. 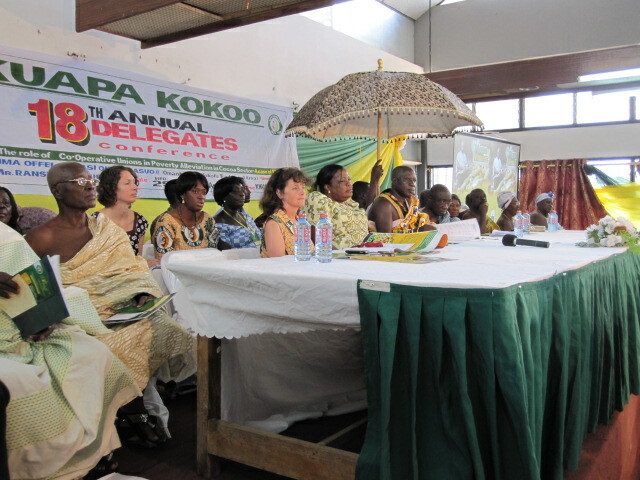 Kuapa now has 65,000 members, 21,000 are women. They deliver 42,000 tonnes of cocoa which is nearly 1% of the world’s cocoa. The database is an essential tool. Kuapa is also doing a pilot series of hour long radio programmes to promote the benefits of being a member of Kuapa and to share important information with the farmers many of whom are deep in the rainforest and very remote. In the evening we had a great party in the grounds of Kuapa’s offices with a local band singing in Twi, a popcorn machine and lots of food, drink and dancing. Those Internal Control Officers sure can dance! You are currently browsing the Divine Delights blog archives for September, 2012.